Now is the time to hit the swamps. The winter that refused to end finally did but mosquitoes and other buzzing pests have yet to appear in mass. Between the snow and the bugs you can rejuvenate the soul by witnessing the arrival of spring in a bog or marsh near you. The key to a wetland walk is boardwalk, an elevated path that keeps your boots dry while allowing you to explore the cornucopia of life that marshes and swamps represent. Boardwalks have made dozens of wetlands accessible in and around Michigan, including the sphagnum bog at Camp Newaygo. Extending through the heart of the bog to the marshy edge of Pickerel Lake is the Wetlands Trail, a 1.25-mile boardwalk that was constructed in 1986 at a cost of more than $37,000. Built into the boardwalk are two observation areas where you can sit and soak in spring or watch for wildlife ranging from great blue herons and kingfishers to muskrats and snapping turtles. The Wetlands Trail is open to the public from April through November. To reach it from Newaygo, head north on M-37 and then west onto 40th Street. Within two miles turn south on Gordon Avenue and then east on 48th Avenue to the trailhead. Mud Lake Bog Nature Preserve: Located in Berrien County, Mud Lake was once a haven for bed springs and beer cans, not wildlife and rare plants. In 1980, the Township of Buchanan purchased the area and invited nearby Fernwood and Love Creek nature centers to help clean up the bog and build a trail. Today Mud Lake is a 106-acre preserve with a mile-long trail, most of it a boardwalk suspended on floating barrels over a mat of sphagnum moss. To reach Mud Lake Bog from US-33 near Niles, head west on US-12 for seven miles and then north on Bakertown Road for two miles. Turn west on Elm Lake Road and the posted entrance of the preserve will be reached in 2.5 miles. Bishop’s Bog Preserve: Located only minutes south of Kalamazoo, Bishop’s Bog is a 140-acre preserve that is crossed by a mile-long floating trail. The trail begins in South Westnedge Park as an asphalt path but quickly becomes a bouncing boardwalk of plastic planking that passes a bench every 1,000 feet. From I-94, depart at exit 76 and head south on Westnedge Avenue to South Westnedge Park in four miles. Proud Lake Recreation Area: This 4,700-acre state park northeast of Ann Arbor has more than eight miles of footpaths but Marsh Trail is by far the most interesting in the spring. The 1.25-mile loop begins by skirting the marshy shoreline of a large pond and then uses a series of boardwalks to cut through a sea of cattails at the west end. A series of interpretive plaques are spaced along the trail. From I-96, depart at exit 159 and head north on Wixom Road. Within six miles Wixom Road becomes Duck Lake Road and passes the park headquarters, where trail maps are available. Point Pelee National Park:Canada’s smallest national park is south of Windsor and contains one of the largest marshes along Lake Erie. 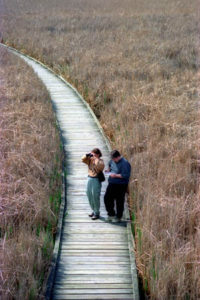 Providing dry footing into the wetland is Marsh Boardwalk, a mile-long loop that leads to a pair of observation towers. Point Pelee and especially the Marsh Boardwalk is birders’ paradise in the spring. The Canadian park is a 50-minute drive from Detroit. From the Ambassador Bridge follow Huron Church Road south and then continue southeast on Highway 3 to Leamington, where signs will direct you to the park. Maumee Bay State Park: The Great Black Swamp once stretched 120 miles along Lake Erie. Protecting a remnant of it today is this Ohio State Park just east of Toledo. You can explore the swamp along the Boardwalk Trail, a two-mile loop that begins at the park’s Trautman Nature Center. The trail includes benches, interpretive signs and an observation tower in one corner. Grass River Natural Area: A good slice of this 1,037-acre preserve in Antrim County is either a sedge meadow, marsh or cedar swamp and the best way to view is along the Sedge Meadow Trail. The 0.7-mile loop is a boardwalk that winds through several intriguing marshes and then skirts the Grass River. The preserve is reached by from US-131 by heading west on M-88 in Mancelona towards Bellaire. When the M-88 swings sharply to the north in two miles, continue west on Alden Highway (County Road 618). The entrance road to Grass Lake is posted along CR-618 before you reach Alden.